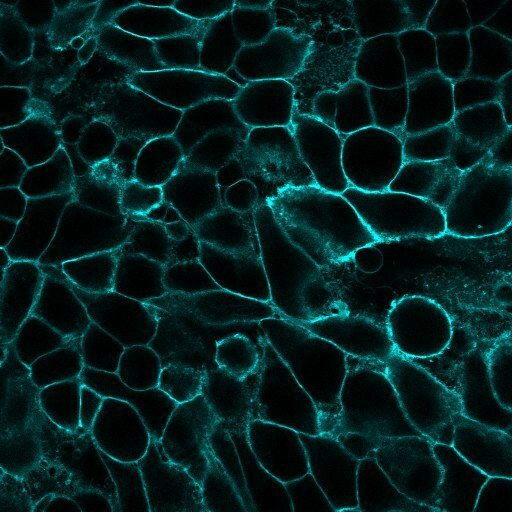 Researchers frequently wish to label the cell surface or plasma membrane to visualize cellular boundaries or cell morphology in multi-color fluorescence imaging. Biotium offers a number of traditional and novel stains that are designed for convenient labeling of live cells, fixed cells, or live cells or for fixation and subsequent immunostaining. See below to find the right stain for your application. *Formaldehyde fixation recommended for CellBrite™ Cytoplasmic Membrane Dyes. Tolerates detergent or MeOH fix? 1. Membrane and cell surface labels will be internalized by endocytosis in live cells over time. 2. Intracellular membranes may be labeled in fixed cells. 3. Formaldehyde fixation is recommended for CellBrite™ Cytoplasmic Membrane Stains. 4. Lectins may be toxic or stimulatory to live cells depending on cell type. See our complete selection of Cellular Stains, or download our Cellular Stains Brochure. 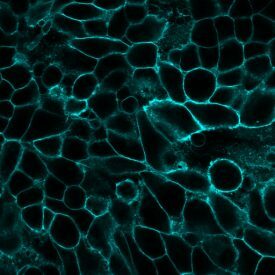 HeLa cells fixed with formaldehyde, then stained with the CellBrite™ Blue Cytoplasmic Staining Kit. 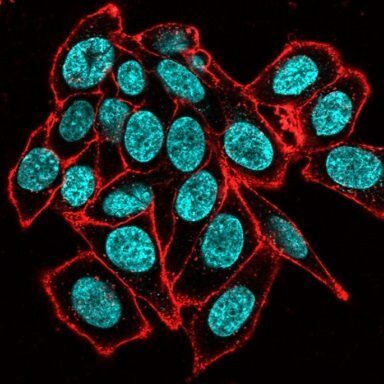 HeLa cells stained with CellBrite™ Fix 555 (red), fixed with MeOH and stained with CF®640R anti-Mitochondrial Marker clone 113-1 (cyan), and NucSpot® 470 (green). 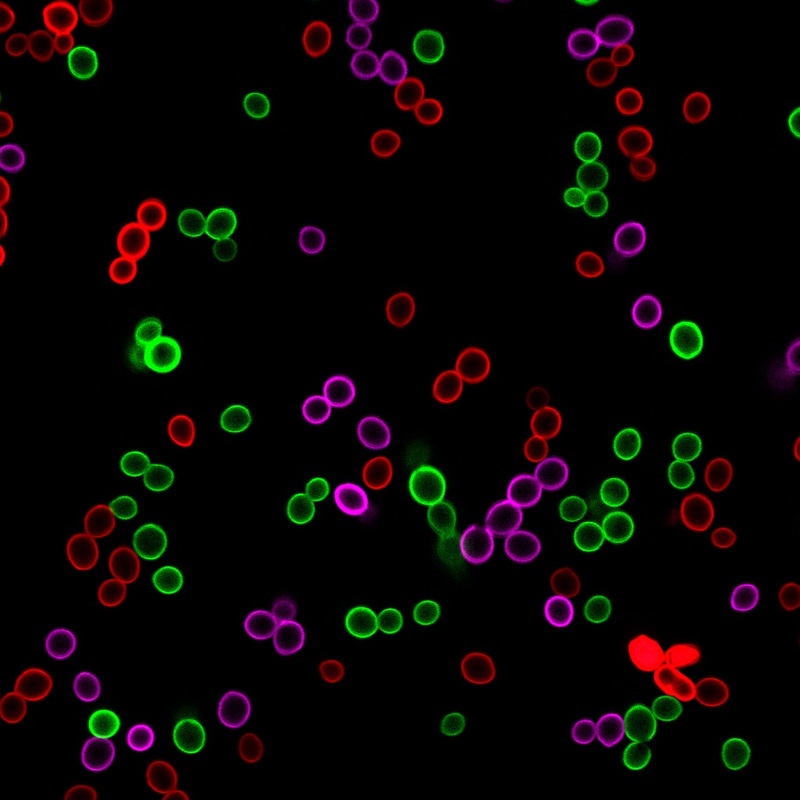 S. cerevisiae stained separately with MemBrite™ Fix 488/515 (green), MemBrite™ Fix 568/580 (red), and MemBrite™ Fix 640/660 (magenta) then mixed. Live HeLa cells stained with CF® 594 Con A (red) and Hoechst 33342 (blue) for 10 minutes at 37°C, then washed and imaged. CellBrite™ Cytoplasmic Membrane Stains are lipophilic dyes for simple, non-toxic, stable labeling of membranes in live or fixed cells. Cells can be fixed with formaldehyde before or after CellBrite™ staining. But the staining has poor tolerance for permeabilization or methanol fixation, so CellBrite™ staining is not easily combined with intracellular immunofluorescence (IF) staining. The dyes also do not stain bacteria or yeast. CellBrite™ NIR dyes are CellBrite™ dyes with near-infrared fluorescence compatible with small animal NIR imaging systems. CellBrite™ Fix and MemBrite™ Fix stains were developed to overcome some of these shortcomings. They are novel covalent stains that can be fixed and permeabilized for IF staining. CellBrite™ Fix Membrane Stains are fluorogenic reactive membrane dyes that rapidly accumulate at the plasma membrane. When they incorporate into lipids, they become fluorescent, and at the same time react covalently with membrane proteins for stable labeling. Staining takes only 15 minutes in a single step with no wash. CellBrite™ Fix stains mammalian cells, yeast, and bacteria. MemBrite™ Fix Cell Surface Stains do not bind lipids, but label cell surface proteins. MemBrite™ Fix requires a two-step staining protocol with washing, but offers a more extensive choice of dye colors than CellBrite™ Fix. MemBrite™ Fix also can be used to stain yeast. But unlike original CellBrite™ dyes and lectins, CellBrite™ Fix and MemBrite™ Fix cannot be used on cells that are already fixed. To select a dye that’s right for your application, see our Membrane and Cell Surface Stains Comparison, or download our Membrane & Surface Stains Brochure. Lipophilic carbocyanine dyes like our original CellBrite™ Cytoplasmic Membrane Stains have been used to stain neuronal cells in culture for several weeks, and in vivo for up to a year (see note below). The dyes do not appreciably affect cell viability, and do not readily transfer between cells with intact membranes, allowing cell migration and tracking studies in mixed populations. Staining with the covalent stains CellBrite™ Fix and MemBrite™ Fix lasts up to 48 hours in tissue culture cells (see note below). Note: Over time, all cell surface stains will be internalized and become intracellular as membranes turn over by endocytosis. The rate of internalization may vary by cell type, rate of membrane turnover, and rate of cell division. In immortalized cells in culture, most of the surface staining becomes internalized over the course of about 24 hours for CellBrite™, CellBrite™ Fix, and MemBrite™ Fix stains. For an alternative stable and fixable stain for long term cell tracking or tracking cells in mixed cultures, see our ViaFluor® SE Cell Proliferation Dyes. 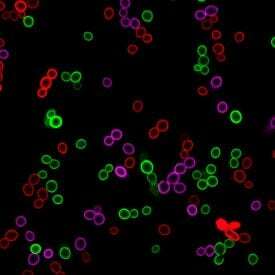 These dyes covalently label intracellular proteins throughout the cell and are non-toxic and fixable. We offer a wide selection of fluorescent organelle stains and other probes for live or fixed cells. Classic membrane and membrane potential dyes, as well as unique dyes for covalent labeling of the cell surface.